Update: Want a raw, vegan version? 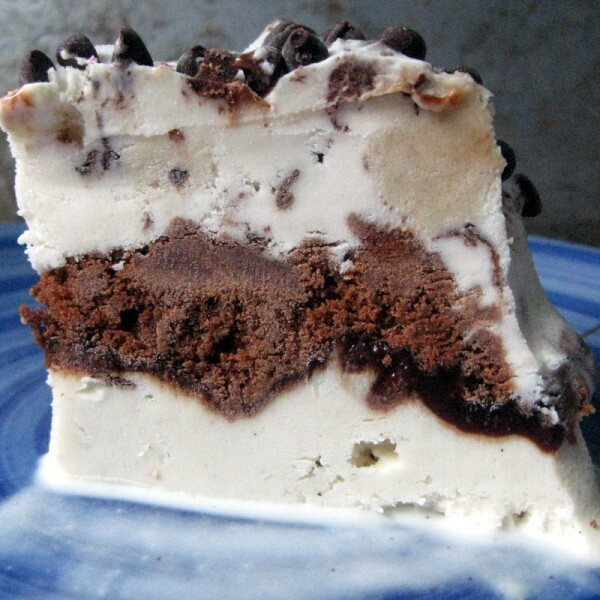 Check out my Better Than Dairy Queen “Ice Cream” Cake – Take Two. My husband’s birthday lands smack dab in the middle of the hot & humid Wisconsin summer. Not a good time to bake a cake. Fortunately, what he wants, what he’s always wanted, isn’t actually a cake. It’s an ice cream cake. Up until this year, that meant a quick trip to the local Dairy Queen for a vanilla fudge crunch million calorie, artificially-flavored, but oh so yummy concoction. Not this year. Now that I’m gluten-free and dairy-free, it hardly seemed like a good idea to go the DQ route. But, it was still too darn hot to bake. What’s a girl to do? Get creative with a few pre-made ingredients and a whole lotta love. And, voila! It’s the Better Than Dairy Queen “Ice Cream” Cake. In a small springform pan or gelatin mold, layer 1 pint of frozen dessert, the crumbled cookie and the chocolate syrup. Top with the second pint of chocolate syrup. Freeze solid. Unmold from the pan. (If using a gelatin mold, you may need to submerge the pan in warm water briefly to get it to release.) Top with chocolate chips and return to freezer until ready to serve. While this recipe might be a wee bit more than sightly indulgent, it does have some redeeming qualities. I mean – it’s gluten and dairy free, right? And, really, there’s not nearly as much refined sugar as there is in the DQ version. And, it’s using healthy coconut milk! So, I’m still linking this as my submission to the Amy’s Simply Sugar and Gluten-Free Slightly Indulgent Tuesdays. And, since it’s definitely gluten-free, I’m also linking it to Gluten Free Homemaker’s Gluten-Free Wednesdays carnival. This entry was posted in Blogger Community, chocolate, coconut, desserts, vegan. Bookmark the permalink. OMG! That looks amazing. Not only better than Dairy Queen but fit for a king or queen, too! Does this have chocolate ice cream in it too… at least that yummy pic looks like it does have 3 flavors of ice cream! Thanks everyone! Laura – nope, that chocolate layer is the crumbled cookie & the chocolate syrup. But, you could definitely put a chocolate layer in it! I almost went with chocolate layer, but then the cookie dough called out to me and I just had to listen. Why does every gluten-free cookie have rice and/or potato flour or startch in it??? SOOOOOO frustrating! My daughter is allergic to rice ad potato! My husband used to buy me an ice cream cake for my birthday before I went gluten free. This looks like a great alternative. Linda – the best thing is, it’s easy enough for even non-cooking husbands to make! Oh wow! I think this is the best recipe I’ve seen in awhile. I love how easy you’ve made it too! Definitely will be making this one! YUM! Thanks Stephanie – it’s definitely an easy one. But, sometimes those are the best, right? How many does this serve? Thanks. Hm…. It was a while ago – but I would say that it would probably serve 6 to 8 small slices, and or 4 to 6 large slices. This is a stunning ice cream cake, Deanna. It’s no wonder it gets so many views. I actually made a gluten-free ice cream cake with Son for his girlfriend years ago. It wasn’t dairy free, but the other ingredients were homemade. It came out beautiful and good, but that was before my blogging days. Don’t know if there’s a photo somewhere. Anyway, I love the cake and may recreate it for Son for his birthday as he’s now gf/df + more. Home made is so much better. I did one this year again, for the kiddo’s dad. And, used some home made GF cookies. Way tastier. But, I still used the store bought ice cream, because I’ve never been able to come up with an ice cream that keeps its texture after being in the freezer a while. Looks delicious. My boyfriend’s birthday is this Friday and his family always gets Dairy Queen ice cream cakes. I was thinking of making a gluten-free one so I could indulge, too, but want to make sure it’s as delicious as he’s used to. (And easy to make because I am so not a gifted-in-the-kitchen girl.) Looks like I might have found a winner. Thanks for posting this!